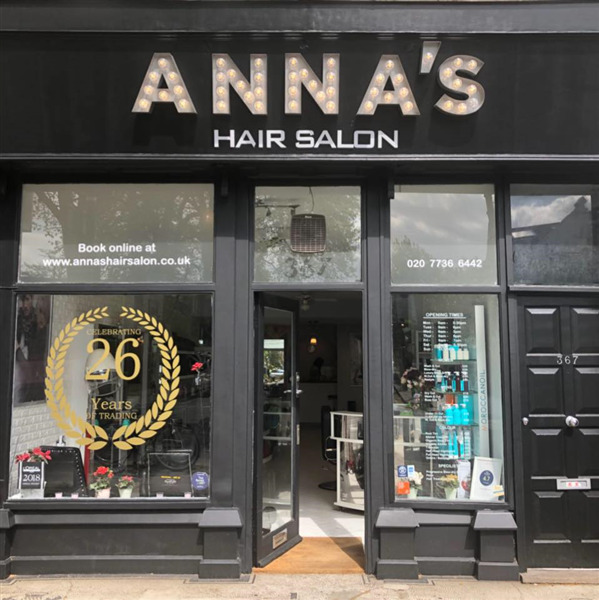 You can book at Anna's Hair Salon Fulham online using our Book Now button located above. Select from a list of services offered, pick your favourite Anna's Hair Salon staff member and book from the dates available. Anna's Hair Salon is a place for all the family. In our dedicated kids area we will trim your babies hair, style your toddlers mop, and work to ensure your kids look stylish and neat. The rest of the salon is comfortable and professional and with a client base spanning three generations you can rest assured that whatever your hair needs we can provide, be that a perm, highlights, extensions, beard shaping, or restyle. All our stylist's are trained in Wella, L'Oreal and Keune colour and maintain the highest standard of hairdressing with each member of staff having on average over 10 years experience. We look forward to welcoming you to Anna's with a smile, good sercice, and a complimentary complimentary tea or coffee. The overall ranking and star rating is based on customer reviews received in the last 6 months. All customers that paid for a service at Anna's Hair Salon were requested to complete an independent review by mylocalsalon (a minimum of 26 reviews are required within the last 6 months to receive a ranking). Been going to the salon now for over eight months with two children also, fantastic friendly place, the girls look forward to going and everyone so friendly I even manage to get my hair cut at the same time, unheard off!!!!!! Five 🌟 Stars!! !